It is a great pleasure to be in New Delhi to present the OECD’s Investment Policy Review of India. Investment policy is a crucial component of the recovery strategies of all countries. In a world where FDI flows have contracted significantly, where corporations are rationalising their investment decisions, the investment climate in our economies is acquiring a magnified importance. Countries have a lot to learn from each other, and this study can made a solid contribution to policy making in this area. In recent years, India has become a major global player with high economic growth rates and is today both a major destination for FDI, and a major source of FDI. 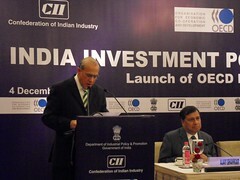 India’s performance in the past year has been particularly impressive in view of the global collapse in FDI flows. This is a vote of confidence in India. First, the regulatory framework: India has made huge steps in improving its regulatory investment environment: the “license raj”, which shackled industry with numerous unnecessary permits, has been largely dismantled. Crucial issues for investors have started to be tackled by the Indian Government, such as IPR protection which has been strengthened. The Competition Commission has just started work this summer and the corporate governance framework has been improved. A more open trade regime is replacing import substitution and protectionism. Much of the economy has been opened to foreign investment. Sectoral FDI restrictions have been eased and foreign ownership caps lifted. Since 2000, the FDI regime has been an OECD-type “negative list” approach in which all sectors not on the list are open to foreign investment. In most manufacturing sectors 100% foreign ownership is now possible and much FDI now comes through the “automatic route”. Foreign exchange restrictions relating to investment have been relaxed. Second, public ownership of industries was substantially reduced as many sectors which were previously reserved for the public sector have been opened to private enterprises, including foreign investment. Third, experimental economic zones have been set up to test further investment liberalisation measures. The government has concluded many bilateral investment promotion agreements and double taxation avoidance agreements since the mid-1990s. Foreign-owned companies are now taxed the same as domestic enterprises. In short, the overall framework for investment, both domestic and foreign, is becoming more supportive in order to reap the full benefits of FDI for India’s growth perspectives. But many challenges remain. As Prime Minister Manmohan Singh pointed out in his speech at the Indian Economic Summit last November 9, 2009, the development of high-quality infrastructure is an essential requirement for India’s rapid growth. India has an ambitious programme of investment to remedy deficiencies in all key infrastructure sectors: power, roads, ports, airports, telecommunications, irrigation and urban infrastructure. While some of these investments will be undertaken through the public sector, the Government of India has called for private investment, including foreign direct investment, to play a large and growing role in achieving these targets. Our Investment Policy Review discusses policy options that may help India achieve its full potential. It suggests a further easing of remaining FDI curbs to support the government's important social and development goals. Many of the remaining FDI restrictions apply to sectors where productivity and growth need to be enhanced, such as banking, insurance and retail distribution. Another major challenge in India is to realign economic growth with equality perspectives: While national economic growth has been impressive since 1991, the gap between the richer and poorer Indian states has widened. This trend needs to be reversed if the government is to reduce inequalities. Poorer, slow-growth states may start catching up if they accelerate implementation of central government policies to promote investment. While the central government has reduced the number of approvals needed for new investment, administrative procedures need to be streamlined at state level. India’s plan to set up a panel of state industrial ministers to encourage state level reforms can help do this. The Indian government could also set up an inter-state forum to evaluate the costs and benefits of states’ investment incentives, including their impact on other states. The OECD has developed a Checklist for FDI Incentive Policies which can be used to evaluate foreign investment incentives. Comparing states’ FDI performance requires reliable FDI statistics. OECD countries are also grappling with this thorny problem and will be happy to share their experience with India. Last but not least, India is rightly proud of its long tradition of rule of law. But for investors – both domestic and foreign -- significant delays in justice can mean bankruptcy – and hence a risk too big to take. Strengthening the capacity of the judicial system could make a big difference to investment. This Review is a landmark in the growing co-operation and enhanced engagement between India and the OECD. India has participated wholeheartedly in the preparatory work at many levels of government and over the whole period from gestation to completion. For our future cooperation we would like to propose four areas of work, which have been highlighted in the report and have featured in our discussions with the Government of India. First; we propose to undertake joint future work on green growth, an important driver for India’s sustainable development. Second; promoting infrastructure development through public-private partnerships. Third; developing nationally consistent regional FDI statistics. Fourth; the launch of a review of the regulatory policies of India, just like we have done with other countries like Brazil, China and Russia. We look forward to continuing co-operation with the Government of India as well as with business, labour and other stakeholders in promoting further improvement in India’s regulatory framework for investment. In this context, let me highlight that we host the Freedom of Investment Roundtables, bringing member and non-member countries together to fight investment protectionism. I am glad that India, an increasingly important outward investor and a substantial recipient of FDI, already participates in this process. The OECD reports regularly to the G20 on crisis-related measures taken by governments that may have implications for international investment. Keeping international investments flowing freely is a vital element in global recovery. This is part of the overall co-operation between the OECD and India in support of fostering a stronger, cleaner and fairer world economy. This is an objective we will achieve only if we work together.